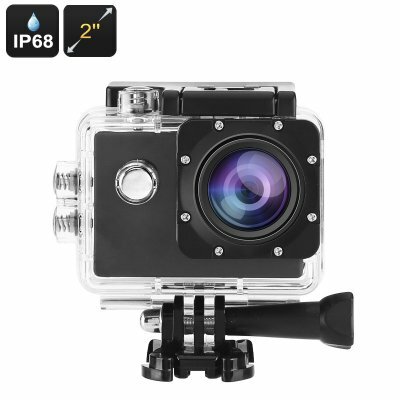 Successfully Added HD Action Camera - IP68 Case, 140-Degree Lens, 2-Inch Display, 5MP CMOS Sensor, 30FPS, 900mAh Battery, 32GB SD Card Slot to your Shopping Cart. Record all your upcoming adventures in stunning 720p HD resolution with this action camera. For those of you that spend plenty of time outdoors, this sports camera offers a great way to snap pictures and shoot breathtaking video. It comes with an IP68 rated cover that is fully waterproof. It will not only protect your action camera against water, but also to sand, dust, and drops. No matter where you’ll be heading next, this action camera will be at your side to shoot crisp HD video. Whether you’re into skiing, mountain climbing, or base jumping – it will follow you anywhere. Thanks to its case that is waterproof to depths up to 30m, it can even be used to snap breathtaking photographs while diving. This HD action camera has been equipped with a 5MP CMOS sensor. This piece of equipment allows it to shoot sharp and detailed images at any given moment. It furthermore packs a 140-degree lens. Thanks to this, you’ll always be treated with a wide viewing angle. With this sports camera, you can be assured that not a single detail of your surroundings stays uncaptured. From now on, you’ll be able to capture all your activities and share a first person view with all your friends and family back home. On its 2-Inch display, your new action camera allows you to instantly watch back previous video and photographs. This allows you to select the right pictures and to make sure that every video is of great quality. Thanks to its 32GB SD card slot, it lets you slide in plenty of external memory. Like this, you can be assured that you’ll never run out of storage in the middle of your recordings. An epic 900mAh battery brings along hours’ worth of usage time for you to enjoy. No matter how much time you spend outside, this sports camera packs enough juice to record a days’ worth of adventures. This HD Action Camera comes with a 12 months warranty, brought to you by the leader in electronic devices as well as wholesale electronic gadgets..